For more than 50 years this family-owned business has provided expert service in assisting guests to select the perfect summer vacation rentals. We also extend special winter rental rates to snowbirds that flock to North Myrtle Beach to enjoy our balmy shores. In addition, golf packages and golf getaways are a specialty of Elliott Beach Rentals for those who come to experience the more than 100 championship courses in this golfer’s paradise. Three specialized divisions of our company: Elliot Beach Rental; Better Homes and Gardens Real Estate Elliott Coastal Living; and Myrtle Beach Golf Authority are designed to assist you with vacation rentals or the purchase of the South Carolina home of your dreams. 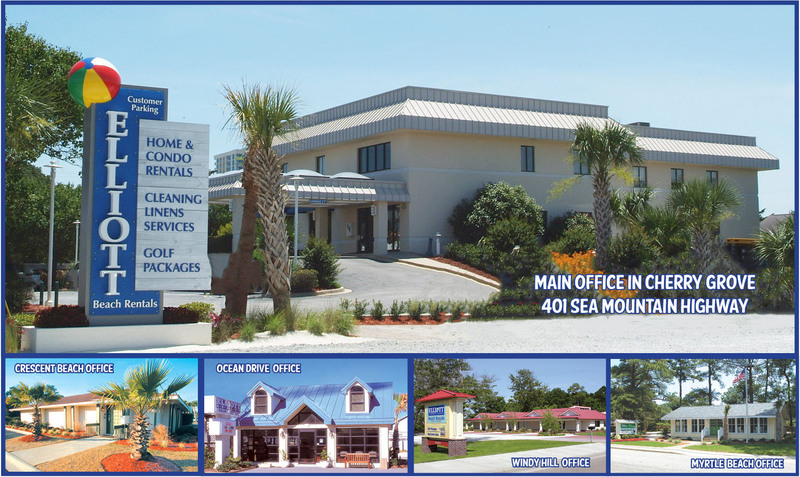 From luxury rentals to cozy, affordable condos, Elliott Beach Rentals offers North Myrtle Beach accommodations to suit every vacation need.You may prefer a discriminating villa with golf course views, or perhaps the natural beauty of a cottage with a dock on a salt marsh channel entices you. We offer lovely town houses in tranquil neighborhoods, spacious beach homes with stunning views, and trendy oceanfront condos in bustling high rise towers near North Myrtle Beach attractions. With a handle on the pulse of the real estate market in the Myrtle Beach area, Better Homes and Gardens Real Estate Elliott Coastal Living is poised to find you the best deals on the hottest properties whether you are seeking a beautiful beach home or a resort investment opportunity. Our knowledgeable and experienced staff is ready to assist you in buying or selling your current property. You may have been dreaming of a golf vacation but are not quite sure how to navigate all the information of selecting the championship courses or finding golf packages that accommodate your group. Myrtle Beach Golf Authority specializes in helping you find the ideal accommodations, the best courses, and will tailor your golf package to your desires, needs and budget. With a goal of exceptional customer service and quality accommodations for guests, www.elliottjobs.com offers a variety of interesting positions. We invite you to become part of our dynamic team.